In this tutorial, you will learn in detail how to configure your own RVIZ session to see only the position data information that you require. 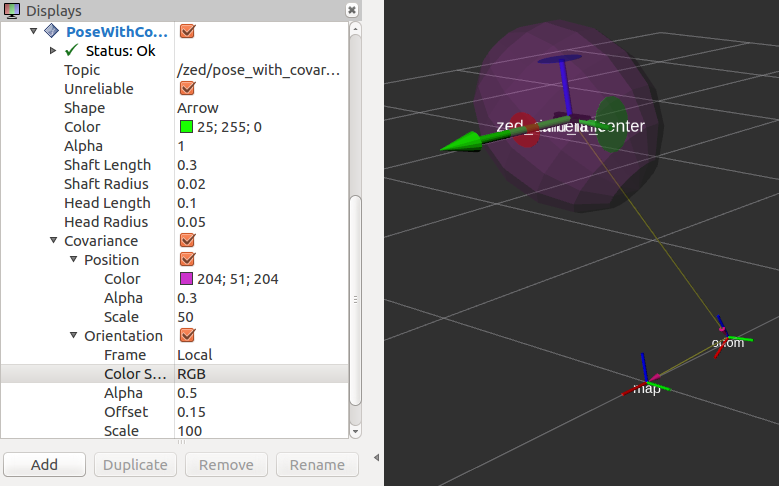 RVIZ provides plugins for visualizing the camera’s pose and its path over time. 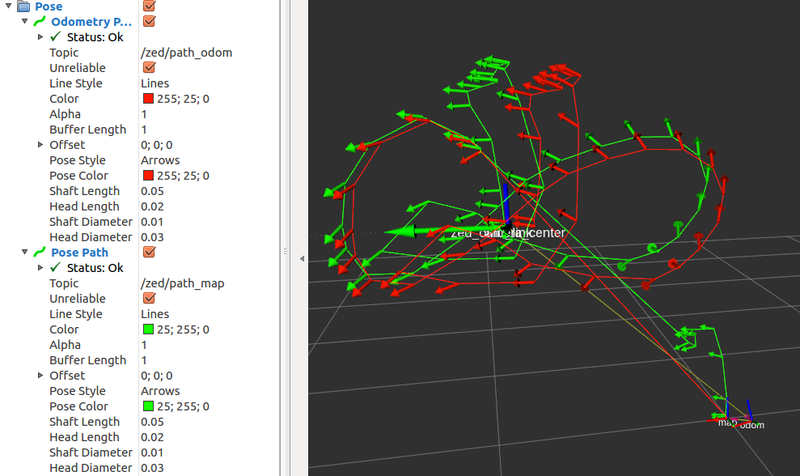 The Odometry plugin provides a clear visualization of the odometry of the camera (nav_msgs/Odometry) in the Map frame. As of ZED SDK v2.6, pose covariance is available if the spatial_memory parameter is set to false in the ZED launch file. You can get a visual estimation of the covariance with the odometry plugin by checking the Covariance option. The position covariance is visualized as an ellipsoid centered in the camera frame. The three orientation covariances are visualized as three 2D ellipses centered on the relative axis. You can change the Scale factors to get a better visualization if the ellipsoid and the ellipses are too big (high covariance) or not visible (low covariance). The Pose plugin provides a visualization of the position and orientation of the camera (geometry_msgs/PoseStamped) in the Map frame similar to the Odometry plugin, but the Keep parameter and the Covariance parameter are not available. The Topic to be subscribed is /zed/zed_node/pose. 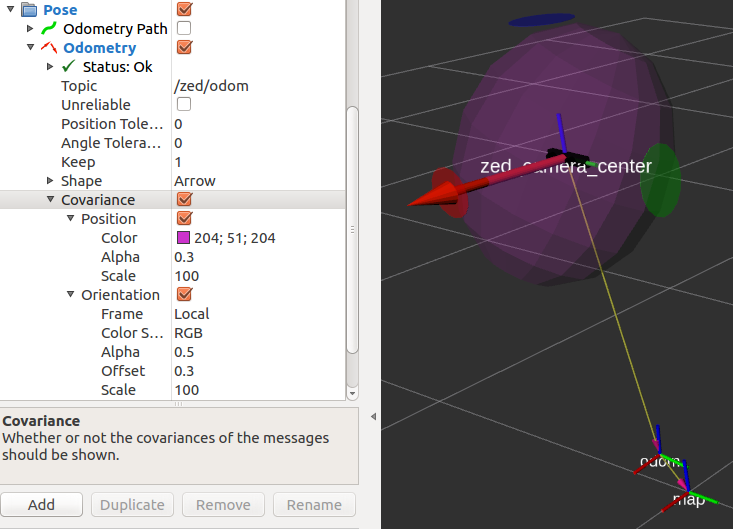 As of ZED SDK v2.6, the pose covariance is available if the spatial_memory parameter is set to false in the ZED launch file and a new topic of type geometry_msgs/PoseWithCovarianceStamped is published. Above you can see both the Pose (green) and the Odometry (red) paths. The odometry pose is calculated with a pure “visual odometry” algorithm as the sum of the movement from one step to the next. It is therefore affected by drift. The camera pose is instead continuously fixed using the Stereolabs tracking algorithm that combines visual information, space memory information and, if using a “ZED-M,” inertial information. The parameters to be configured are analogous to the parameters seen above for the Pose and Odometry plugins. In this tutorial, you will learn how to write a simple C++ node that subscribes to messages of type geometry_msgs/PoseStamped and nav_msgs/Odometry to retrieve the position and the orientation of the ZED camera in the Map and in the Odometry frames. The ZED node starts to publish messages about its position in the network only if there is another node that subscribes to the relative topic. The ROS wrapper follows ROS REP105 conventions. If you move your camera by hand, you will see how the position and orientations are updated in real-time, and how odom and pose will drift one by the other due to the fact that odom pose is pure odometry data and is not fixed. * This tutorial demonstrates receiving ZED odom and pose messages over the ROS system. The following is a brief explanation about the above source code. The two callbacks are very similar; the only difference is that poseCallback receives messages of type geometry_msgs/PoseStampedand odomCallback receives messages of type nav_msgs/Odometry. These are similar but not identical. However, the information extracted by the two topics is the same: camera position and camera orientation. Extracting the position is straightforward since the data is stored in a vector of three floating point elements. Extracting the orientation is less straightforward as it is published as a quaternion vector. To convert the quaternion to a more readable form, we must first convert it to a 3x3 rotation matrix from which we can finally extract the three values for Roll, Pitch and Yaw in radians. Finally, we can print the information received to the screen after converting the radian values to degrees. The main function is very standard and is explained in detail in the “Talker/Listener” ROS tutorial. The full source code of this tutorial is available on GitHub in the zed_tracking_sub_tutorial sub-package. Along with the node source code, you can find the package.xml and CMakeLists.txt files that complete the tutorial package.